In March 2007 Federal Mogul transferred the production of Prototype/Special Make gaskets to Atlas Autoparts Ltd. The transfer included the specialised tooling and machinery used in the Prototype Department. The specialised staff associated with this section were also re-employed by Atlas Autoparts. The company now makes a range of cylinder head gaskets and ancillary seals, primarily for veteran, vintage and classic cars. Atlas Autoparts also specialises in the manufacture and modification of cylinder head gaskets for high performance race engines and is the sole producer of genuine Coopers Rings. 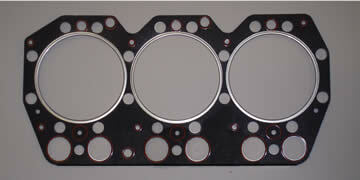 The company also makes cylinder head gaskets for tractors, stationary engines and motorcycles, and in addition to making gaskets from original tools, Atlas Autoparts designs, develops and manufacture gaskets to pattern. For more information about how we can hlp you with your gasket requirements, please contact us.